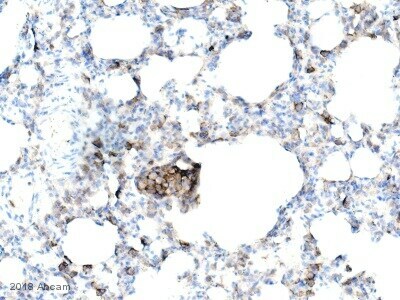 Rabbit polyclonal CD44 antibody. 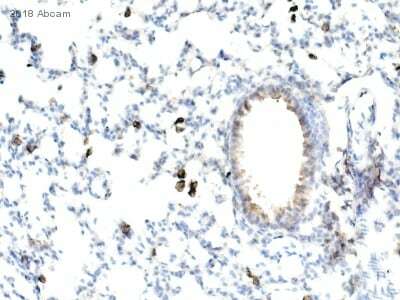 Validated in WB, IP, IHC, Flow Cyt, ICC/IF and tested in Mouse, Rat, Human. Cited in 36 publication(s). Independently reviewed in 17 review(s). Synthetic peptide, corresponding to a region within amino acids 692-742 of Human CD44 (NP_000601.3). ab157107 was affinity purified using an epitope specific to CD44 immobilized on solid support. Our Abpromise guarantee covers the use of ab157107 in the following tested applications. WB 1/2000 - 1/10000. Predicted molecular weight: 81 kDa. Receptor for hyaluronic acid (HA). Mediates cell-cell and cell-matrix interactions through its affinity for HA, and possibly also through its affinity for other ligands such as osteopontin, collagens, and matrix metalloproteinases (MMPs). Adhesion with HA plays an important role in cell migration, tumor growth and progression. Also involved in lymphocyte activation, recirculation and homing, and in hematopoiesis. Altered expression or dysfunction causes numerous pathogenic phenotypes. Great protein heterogeneity due to numerous alternative splicing and post-translational modification events. Isoform 10 (epithelial isoform) is expressed by cells of epithelium and highly expressed by carcinomas. Expression is repressed in neuroblastoma cells. The lectin-like LINK domain is responsible for hyaluronan binding. Proteolytically cleaved in the extracellular matrix by specific proteinases (possibly MMPs) in several cell lines and tumors. O-glycosylated; contains more-or-less-sulfated chondroitin sulfate glycans, whose number may affect the accessibility of specific proteinases to their cleavage site(s). Phosphorylated; activation of PKC results in the dephosphorylation of Ser-706 (constitutive phosphorylation site), and the phosphorylation of Ser-672. 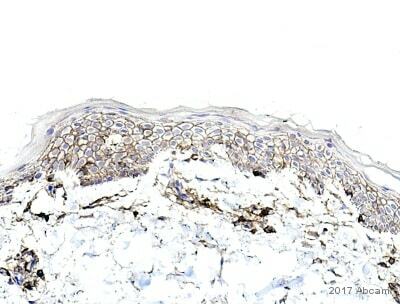 Immunohistochemical analysis of paraffin-embedded human skin tissue labeling CD44 with ab157107 at 1/2000 dilution followed by goat anti-rabbit IgG H&L (HRP) (ab97051, 1/500). The sample was counter stained with hematoxylin. ab157107 staining CD44 in the Human gastric cancer cell line by Flow Cytometry. Cells were fixed with paraformaldehyde and permeabilized with 0.5% Triton X-100. The sample was incubated with the primary antibody (1/100) for 30 minutes at 4°C. 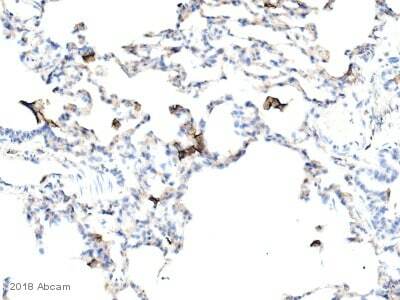 An Alexa Fluor® 647-conjugated Goat anti-rabbit IgG (1/1000) was used as the secondary antibody. ab157107 staining CD44 in C6 cell membranes by ICC/IF (Immunocytochemistry/immunofluorescence). Cells were fixed with 4% PFA, permeabilised with 0.1% Triton-X and incubated with primary antibody (1/1000). An Alexa Fluor® 488-conjugated goat anti-rabbit IgG (ab150077) was used as the secondary antibody at a dilution of 1/1000, shown in the top left hand panel. Additionally, ab7291 anti-tubulin and nuclear stain DAPI (blue) were used as counterstains as shown in the top right hand panel. Negative control 1: Primary ab157107 and ab150120 Alexa Fluor®594 goat anti-mouse secondary were both used at a dilution of 1/1000. Negative control 2: ab7291 anti-tubulin and ab150077 AlexaFluor®488 Goat anti-Rabbit secondary were both used at a dilution of 1/1000. 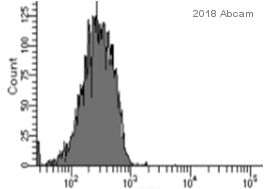 The expression of CD44 in MCF-7 is low (PMID: 25635866; PMID: 26005723). Jurkat does not express CD44 (PMID: 24127558). 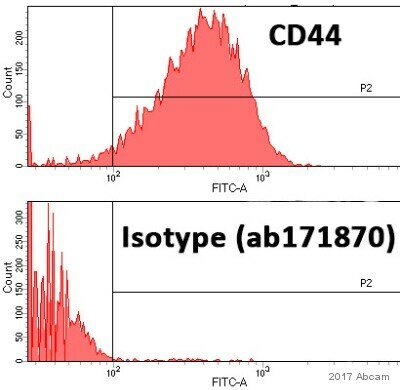 Detection of CD44 in Immunoprecipitates of HeLa whole cell lysates (1 mg for IP, 20% of IP loaded) using ab157107(Lane 1). For WB detection an ab157107 was used at 1 µg/ml. Lane 2 represents control IgG IP. Detection: Chemiluminescence with an exposure time of 30 seconds. Immunohistochemical analysis of paraffin-embedded mouse spleen tissue labeling CD44 with ab157107 at 1/2000 dilution followed by goat anti-rabbit IgG H&L (HRP) (ab97051, 1/500). The sample was counter stained with hematoxylin. Immunohistochemical analysis of paraffin-embedded rat spleen tissue labeling CD44 with ab157107 at 1/2000 dilution followed by goat anti-rabbit IgG H&L (HRP) (ab97051, 1/500). The sample was counter stained with hematoxylin. Immunohistochemical analysis of paraffin-embedded human pancreas cancer tissue labeling CD44 with ab157107 at 1/2000 dilution followed by goat anti-rabbit IgG H&L (HRP) (ab97051, 1/500). The sample was counter stained with hematoxylin. Immunohistochemical analysis of paraffin-embedded human cervical cancer tissue labeling CD44 with ab157107 at 1/2000 dilution followed by goat anti-rabbit IgG H&L (HRP) (ab97051, 1/500). The sample was counter stained with hematoxylin. Immunohistochemistry (Formalin/PFA-fixed paraffin-embedded sections) analysis of human ovarian carcinoma tissue labelling CD44 with ab157107 at 1/1000 (1µg/ml). Detection: DAB. Immunohistochemistry (Formalin/PFA-fixed paraffin-embedded sections) analysis of human colon carcinoma tissue labelling CD44 with ab157107 at 1/1000 (1µg/ml). Detection: DAB. 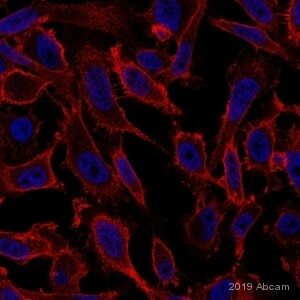 ab157107 staining CD44 in MDA-MB-231 cell membranes by ICC/IF (Immunocytochemistry/immunofluorescence). Cells were fixed with 4% PFA and permeabilized with 0.1% Triton-X. 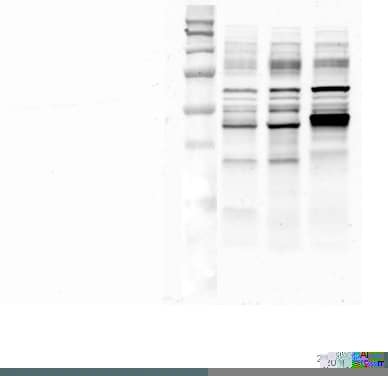 Samples were incubated with primary antibody and an Alexa Fluor® 488-conjugated goat anti-rabbit IgG (ab150077) was used as the secondary antibody, both at a dilution of 1/1000, shown in the top left hand panel. Additionally, ab7291 anti-tubulin and nuclear stain DAPI (blue) were used as counterstains as shown in the top right hand panel. 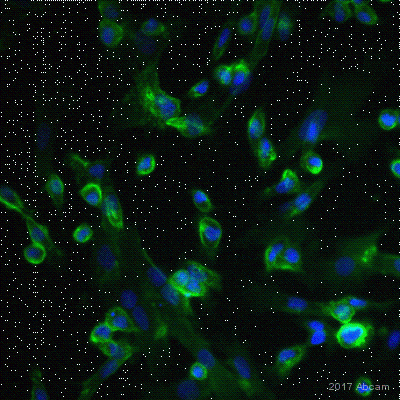 ab157107 showing negative staining of CD44 in MCF-7 cells by ICC/IF (Immunocytochemistry/immunofluorescence). Cells were fixed with 4% PFA and permeabilized with 0.1% Triton-X. Samples were incubated with primary antibody and an Alexa Fluor® 488-conjugated goat anti-rabbit IgG (ab150077) was used as the secondary antibody, both at a dilution of 1/1000, shown in the top left hand panel. Additionally, ab7291 anti-tubulin and nuclear stain DAPI (blue) were used as counterstains as shown in the top right hand panel. ab157107 showing weak staining of CD44 in NIH/3T3 cells by ICC/IF (Immunocytochemistry/immunofluorescence). Cells were fixed with 100% methanol and incubated with primary antibody (1/1000). An Alexa Fluor® 488-conjugated goat anti-rabbit IgG (ab150077) was used as the secondary antibody at a dilution of 1/1000, shown in the top left hand panel. Additionally, ab7291 anti-tubulin and nuclear stain DAPI (blue) were used as counterstains as shown in the top right hand panel. Publishing research using ab157107? Please let us know so that we can cite the reference in this datasheet.